Neri Oxman will be participating in the Reykjavik Art Marathon. 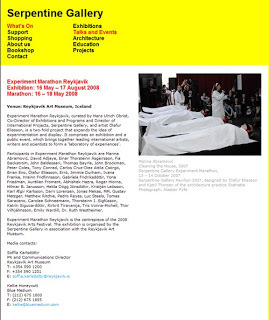 The event will take place from the 16th to the 18th of May as part of a large exhibition that is Reykjavik Art Museums’s contribution to the Reykjavik art Festival in 2008. The project is a collaboration between RAM and the Serpentine Gallery in London and is a continuation of two previous Marathons created at Serpentine Gallery. The curators are Hans Ulrich Obrist, from the Serpentine Gallery in London and the artist Ólafur Elíasson. The overall focus of the project is experimentation, for which the RAM will become a laboratory in which leading artists, architects, film-makers, academics and scientists will create an environment of invention through a series of installations, screenings, performances and experimental films.